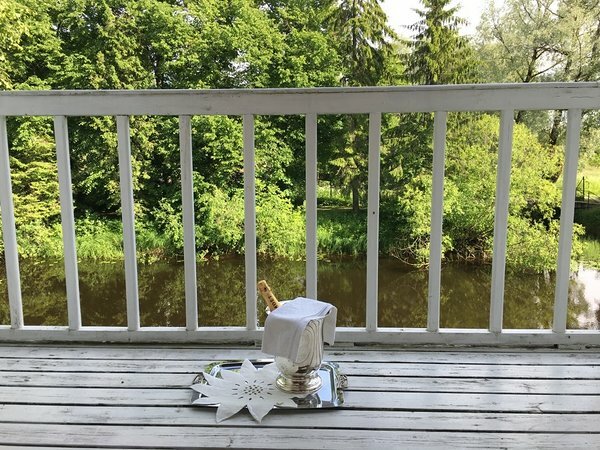 River Villa is a two floor romantic building nex to Pirita river. The bedroom is on the second floor and on the first floor there is a room with TV and fire place, sauna, dining room and kitchen corner. From the bedroom, ther is the most amazing view from the belcony to the Pirita River. You can even do fishing from the belcony, because the house is so close to the river. The house has a wood heating sauna and two wood-burning fireplaces. The first floor has a south terrace with tables and chairs. The sun shines on terraces all day. Tere is an outdoor fireplace where you can grill meat, fish or etc. In the kitchen area of ​​the house there are all necessary for cooking and eating. In addition, there is a coffee maker, a fridge, a toaster, a microwave and etc. A room on the first floor has TV with all needed channels, a DVD player and a game console with various games. In the summer time, roses and other beautiful flowers grow in the yard. There is a staircase to the river for swimming. The water in the river is the warmest in July and August. About 20-23 degrees. It is also possible to use a rubber boat on the river. The river is about 2 meters deep. There are no close neighbors around the yard. On the other side of the river is the Freedom Fighting Museum, which talks about the freedom of the Estonian people. Open every day. Tallinn's city center is within a 20-minute drive of River Villa. The villa can also be reached by train from Tallinn. The length of the journey from the Baltic station to the Lagedi stop lasts 17 minutes. Walk from the railway station to River Villa is about 15 minutes. The train ticket costs around 2 euros. Airport of Tallinn is about 15 minutes drive away form Villa.